EE Times reports ARM shared details about the Mali-450, a new graphics processor based on the company's Utgard architecture. The Mali-450 promises twice the performance of the Mali-400 and can be scaled up to eight cores (also twice as much). The Mali-450, which is offered as synthesizable RTL, is intended for use in entry-level and mid-range smartphones. The core, codenamed Tyr, has a common software platform with Mali-400 and provides market-leading OpenGL ES2.0 performance. Steve Steele, senior product manager in the media processing division, said that the Mali-450 was not simply a doubling of the multicore scalability of the Mali-400. He said that tweaks had been done to the internal graphics engines "You would get better performance from the Mali-450 but it occupies slightly more area," he said. 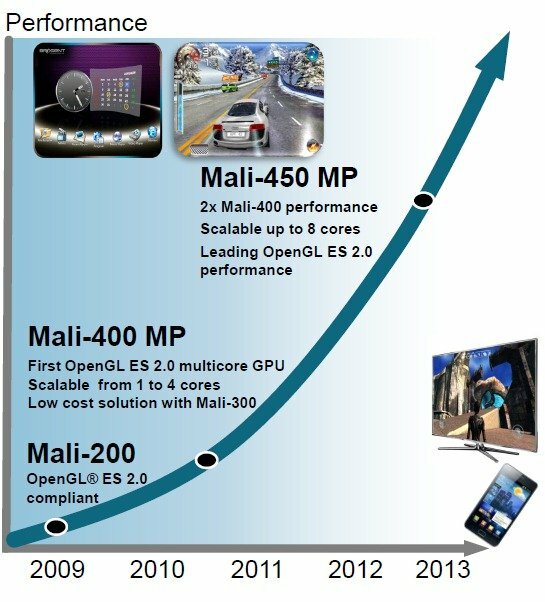 ARM's recommendation is that for lower graphics burdens the Mali-400 with one to four cores is used while for higher performance the Mali-450 with five to eight cores is used. There are close links between the GPU and Cortex-based CPUs playing to ARM's strength and allowing minimum transistor count in the interface, thereby further saving energy and easing time to market.